The summer has sneaked up on us. We enjoyed a brief respite, celebrating the 4th of July with friends and family. Tomorrow, we return to market at the start of a summer heat wave. 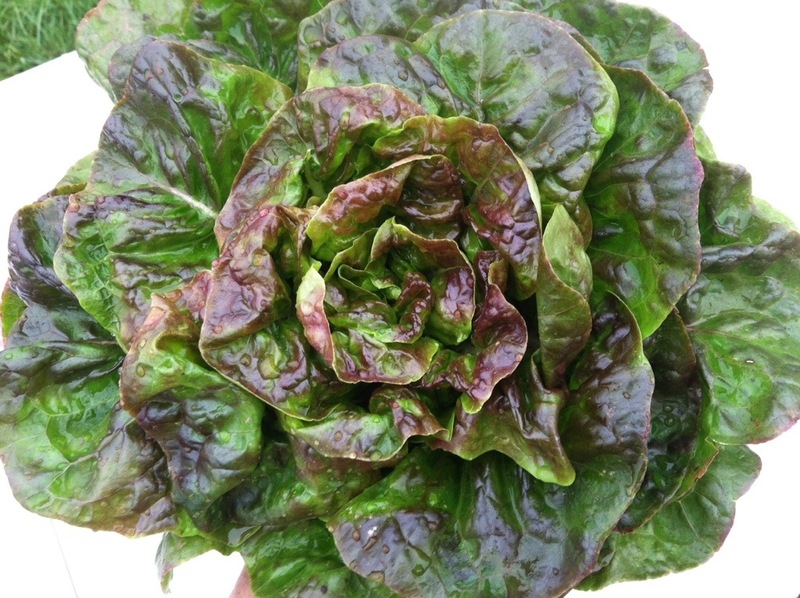 The lettuces and I are wilting, but the summer fun crops are starting to make themselves known. 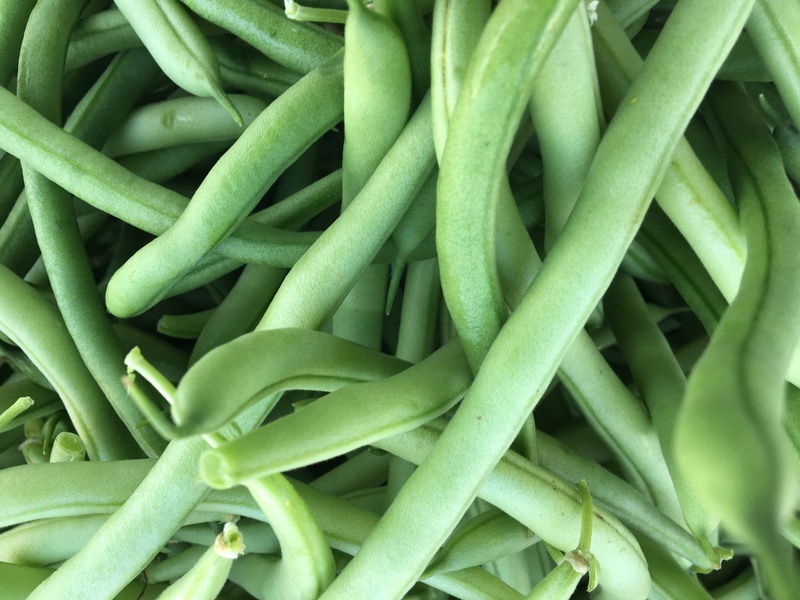 Coming tomorrow to the Pulaski Market is one of our summer favorites – green beans! Also making their debut – beets! Coming soon – tomatoes, peppers and squashes. We also will have other favorites: onions, turnips, radishes, kales, cabbages, herbs and more. We hope to see you at the old train depot, downtown Pulaski (4-8). 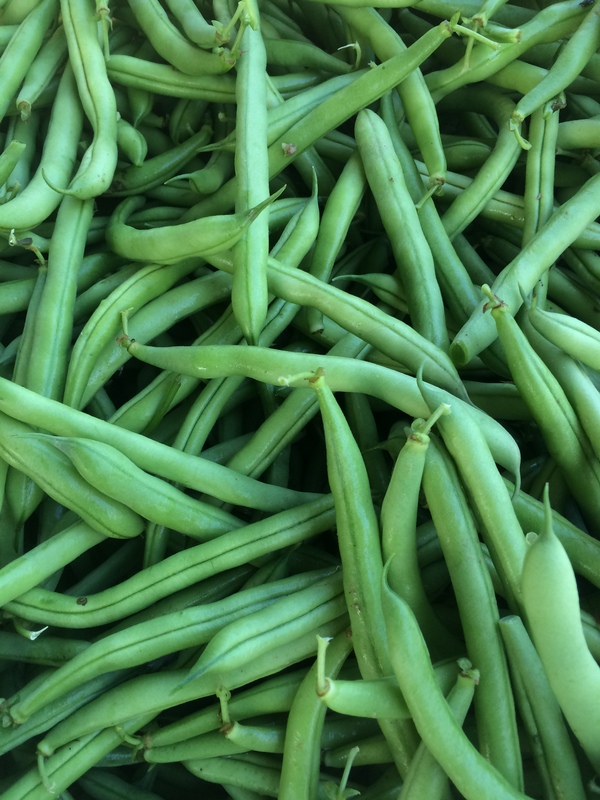 With these guys coming in fast and strong, it’s time for a green bean recipe. Whisk together first 6 ingredients in a small bowl until combined. Gradually whisk in oil in a slow, steady stream, whisking constantly until smooth. Whisk in green onion and tarragon. Use immediately, or store in an airtight container in refrigerator up to 2 days. Let chilled dressing stand 30 minutes before using. 1. Preheat oven to 425°. Cut fingerlings in half lengthwise, and place in a large bowl. Toss with 1 Tbsp. olive oil, 1/2 tsp. salt, and 1/2 tsp. pepper. Place potato halves, cut sides up, in a jelly-roll pan. Toss green beans with remaining 1/2 Tbsp. oil, 1/2 tsp. salt, and 1/4 tsp. pepper, and place in another jelly-roll pan. 2. Bake potatoes at 425° for 30 to 32 minutes or until tender and browned. Remove from oven, and let potatoes stand in pan. 3. Bake green beans at 425° for 12 minutes. 4. Arrange green beans around roasted potatoes on a serving platter. Drizzle with Creamy Tarragon Dressing. *1 1/2 lb. small red potatoes, halved, may be substituted with a bake time of 35 minutes. 1 1/2 lb. russet potatoes, quartered, may be substituted with a bake time of 40 minutes. Copyright © 2015 Time Inc. Lifestyle Group. All Rights Reserved. So this morning, I write to you in a more coherent state than I thought might be possible given the fact that I did not go to bed until after 1am this morning. Understand, that some mystical force takes over control of my eyelids almost always at 10pm sharp. I cannot explain it. They just get SOOOO heavy. You nearly could set a watch by me and my zzzzzs (ask Jordan…I do not exaggerate here). So, for me to be up until 1am is for a darn good reason….FOOD. Today, we are going to talk about our new investment in our future…and…my first foray into the world of canning low-acid foods (ha, sounds like I know what I am talking about doesn’t it). Low-acid foods? What? 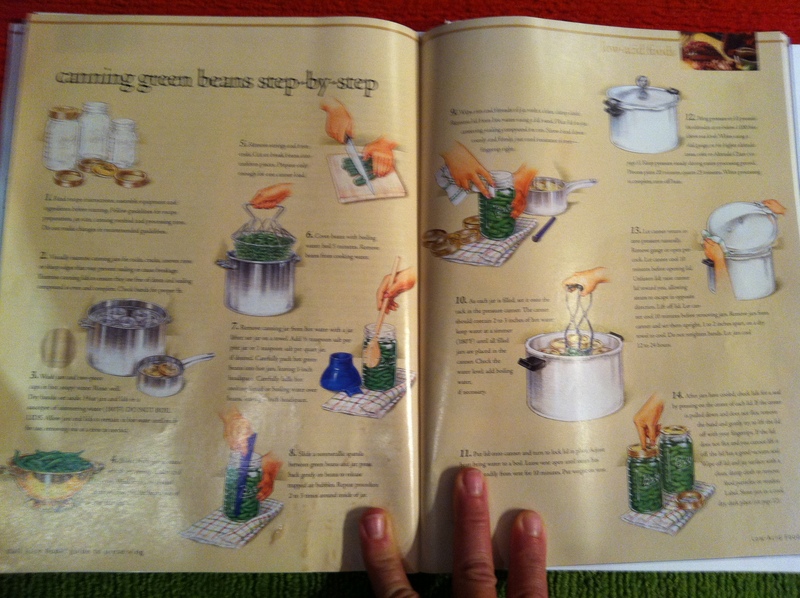 In this instance, I am talking about green beans….and…da.da.da.dum…..use of a pressure cooker/canner. Go ahead and laugh. 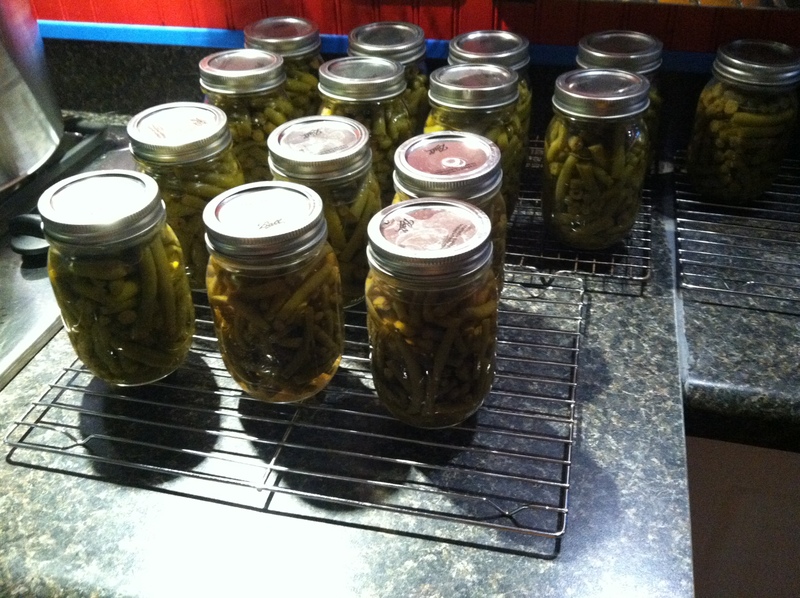 I will admit to you freely that I was fearful (**cough** terrified) of this canning experience. When something comes with colorful DANGER warnings plastered all over it…and the owner’s manual (which I read cover to cover) clearly states that if a warning label is removed or wears off that a new one must be ordered from the company IMMEDIATELY…I am a bit more reluctant to have a “throw caution to the wind” kind of attitude. Contents are, after all, under pressure (that means they can explode). Couple that possible PHYSICAL danger with the health risks inherent in improper canning of low-acid foods (this part is where my science and medical background ***read germophobe*** come in to play, and I envision a horrible, nasty death by bean botulinum), and basically, I become a wreck of nervousness. Anyway, this experience shouldn’t be negative. I need to channel my inner adrenalin junkie and roll with it. After all, it is OUR first harvest for us and family. It’s a celebration. Dang-it, let’s celebrate. So, our mission was to prep, wash and can green beans I had harvested on Tuesday. The clock was ticking on freshness and nutritive value. We chose to accept the mission. After dinner, Team Tanner went to it. Many thanks to mom and dad for their tireless and joyful (I might be exaggerating a tad here) help in the jar, lib and bean prep area. I don’t have my notebook with me, but I think we prepped around 15 pounds of beans (Provider, French Velour Filet, Roma beans…the latter I didn’t get to can). I chose to use pint jars as most of our family is down to one or two folks per household…a pint seemed like a good serving size. Thanks to Dad for buying up Lowes’ supply. Canning stuff got marked down to half price Tuesday. Boy, did all the spoils come in handy. Mom washed 19 jars, lids and rims for me. Dad also picked up this book yesterday. I have Ball’s big recipe book. Turns out this one was nice for the step-by-step instructions and pictures. Sorry this picture is fuzzy. I will try to get a better one. I studied the heck out of these two pages. 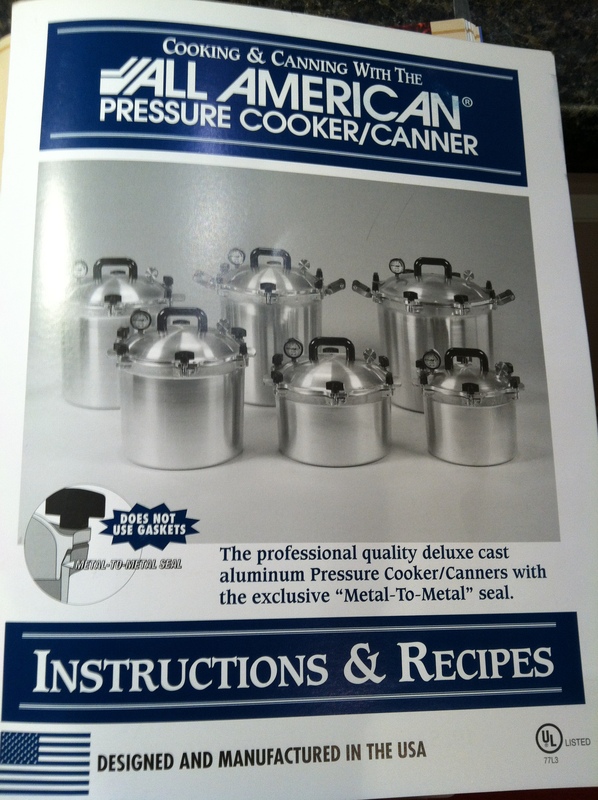 This manual shows our new cooker/canner – made in Wisconsin, it truly is all American. I was in Blacksburg for this adventure, using my parents for free labor and their gas cook top. 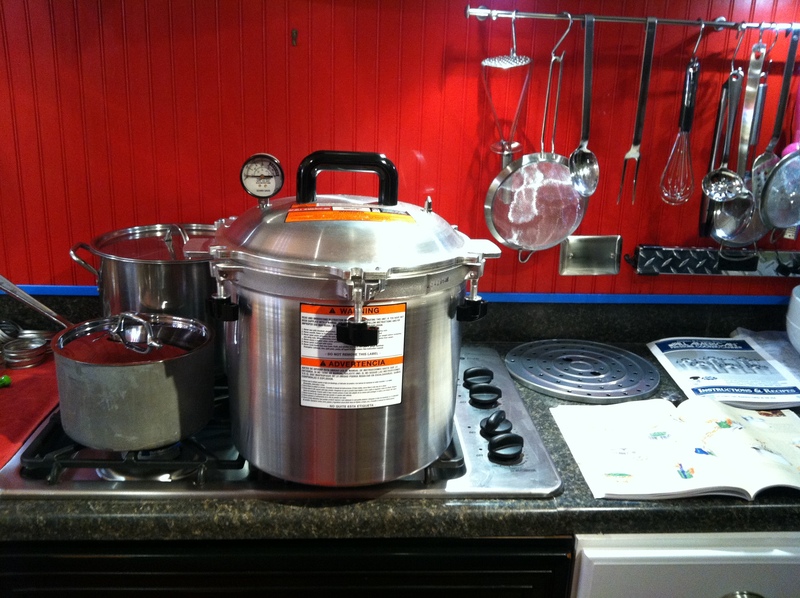 I decided that an 8 burner stove might be best…but that is another story. I think you can see in the photo that the work area was tight (a small sauce pan was behind the canner and was used for the lids). Every burner in use. Yowza. A rack was placed in the bottom of the canner. You can see the second rack (the round disk with holes) one the counter to the right, next to the manual. Love that you can stack the jars! Three inches of water was placed in the canner and set to simmer. Here is my first bean batch. These are the French Velour Filet beans. Too bad the purple color morphs into green with cooking. They still taste great. I boiled the beans for 5 minutes and hot-packed the jars (which also were kept hot by simmering in another pot). Carefully, the hot water is emptied from the jars. The beans are taken out of the boiling water after five minutes then they are tightly packed into the hot jars. 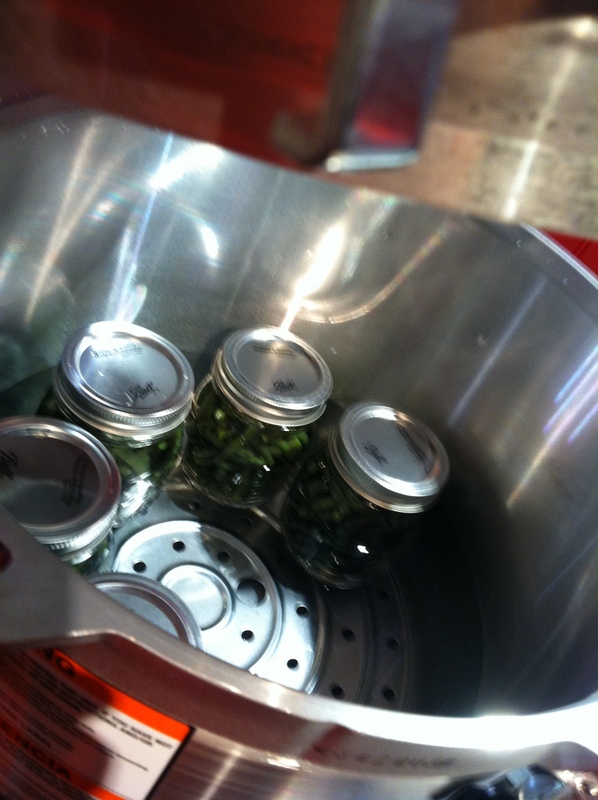 The boiling water is then ladled into the jars via a funnel. I used the bean water because it contains nutrients that escape the beans during boiling. The boiling step added another layer, but the information I read said that hot-packed items have more flavor. Forget convenience, I am all about flavor. Anyway, it is important to remove any trapped air in the jars and to maintain a 1 inch head space. My canning kit came with a handy plastic spatula for jostling out trapped air. It also had a notched end for measuring head space. Nice. You can kinda see it in the right of the photo. I wiped the rims with a clean cloth. My kit also came with a lid catcher. That isn’t the tool’s real name…it’s a something wand…but the point is it is a plastic jobber with a magnet on the end…essential for retrieving those lids out of the hot, simmering water. I placed the lid and screwed it on with the threaded rim to finger tight. The filled jars hung out in the canner. Then I started the whole thing over again with the Provider green beans. Heated empty jars, boiled beans for 5 minutes. Packed jars with beans and liquid. Remove air. Check head space. Wipe. Cover. Canner. I read that the canner holds 19 pint jars. 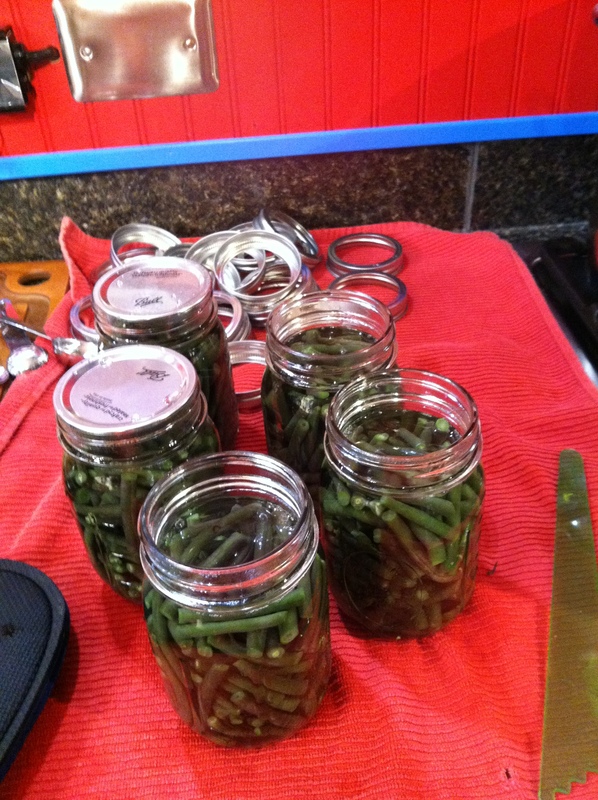 Thinking that 19 jars would be enough for all beans…I was surprised to find out that we would only be canning the velour and provider beans. Well, hang on, Romas, for another day. Anyway. I filled the canner with two layers of jars for a total of 17 jars. Closed the lid. Allowed the canner to exhaust (again, it sounds like I know what I am talking about…but this term comes from reading, and re-reading the Guide book and the Manual 62 times in a 42 minute span) which is letting a constant flow of steam go through the vent. After 10 minutes of being exhausted (the canner, not me…it was near 11 o’clock by the time I sealed the canner…I was already exhausted), I put the pressure regulator weight thingy on the vent. I used 15 lbs because Blacksburg is above 1000 ft sea level. Then, I sat with Franklin on the kitchen floor and waited for the destruction (CONTENT UNDER PRESSURE). Actually, I waited for the weight thingy to start spitting and sputtering (i.e. scaring the crap out of me). This noise is a memory I have of my youth when in Kansas…Kansas? It could’ve been Mississippi…anyway, one of the places we live, mom did a little canning. The spitting thingy reminded me of a sprinkler…spit..spit..spit..spit…tttttttttttttttt. quiet. quiet. quiet. Then…spit…spit…spit…spit….ttttttttttttttt. Ah. Memories. I didn’t realize how long it would take to get to the point of being freaked out by the vent. 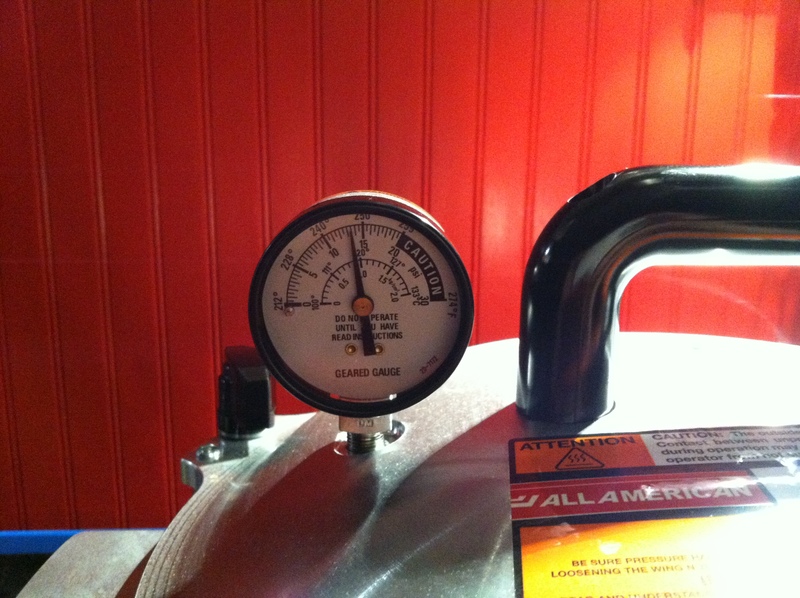 Of course, here is where my timidity comes in to play…I should’ve cranked the stove up higher than I had it. I was so worried about boiling off the water and ruining our new canner….of too much pressure building up….of my own shadow. Who knows, it was after midnight at this point (I am 5 hours into this action now, having started after dinner and bean prep at around 7pm). Anyway, I did nearly pee myself when the thingy finally started to wiggle and spit. I played with the stove setting to keep the spitting to less than 4 scares per minute. Then, the next 20 minutes of processing time actually flew fast. Before I knew it, the fear and the trepidation were no longer necessary. I was done. I turned of the heat and let the beastie vent on its own while I went upstairs and hit the shower.